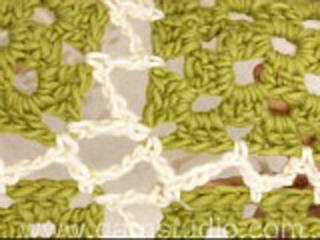 In this DROPS video we show a basic method on how to crochet granny squares togehter. Crochet 1 dc in the ch-space in the corner on one square, ch 2, 1 dc in the ch-space in the corner on the other square, * ch 4, 1 dc in next ch-space on the first square, ch 2, 1 dc in next ch-space on the other square *, repeat from *-*. 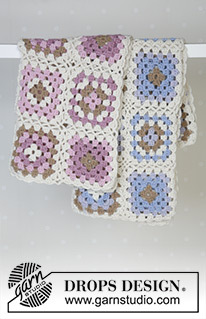 Crochet squares tog first at length and then across. Toppen nu kan jag få ihop mina egna rutor! Pero si el aplique es en redonde y en la ultima linea se termina con punto de tricot, como puedo unirlas.